Anybody who’s ever visited Exeter will know that both the city centre and the quayside are packed with restaurants to suit even the fussiest of eaters, and in December Exeter’s newest culinary hotspot opened its doors. Base and Barley has taken two classic favourites – pizza and beer – and put their own modern spin on them. Serving freshly made, sourdough pizzas and featuring an extensive list of craft beers, wines and cocktails Base and Barley looks set to become a new favourite for foodies in Exeter. It’s run by the same team behind the South West’s popular coffee and wine bar chain Artigiano and so expectations were more than high when I went to see if Base and Barley lived up to all the hype. Situated in the city centre, Base and Barley immediately stands out as fresh and modern thanks to its stylish lighting and décor. It’s around 8:30pm on a Friday night and the building is appropriately packed. Luckily there is a bar area distinct from the restaurant, so you’ll have plenty of time to peruse the long list of drinks and sample your favourite should there be a wait. Once seated in one of the artistically light booths I examined the drinks menu which featured around 15 different craft beers to choose from as well as a fine selection of wines, soft drinks and cocktails. I opted to try the gin and blackberry Bramble cocktail alongside my refreshing Sicilian lemonade. The food menu was less extensive – despite being a pizza themed restaurant there are only eight different pizzas to choose from (creatively named No.1, No. 2 etc.) and it was somewhat disappointing to learn that amongst this eight was a regular Margarita, a ham and mushroom and a cheese and pepperoni. There was the option of creating your own pizza but with each topping costing 75p this seemed like a rather expensive option. Having said this, the menu is more than reasonably priced with every pizza coming in at under £8 and the selection of starters seemed much more authentically Italian compared with the usual array of dishes I expected to see. To start I tried the delicious oven roasted chorizo which came in a red wine jus, served with a light salad, as well as some dough sticks served with a garlic butter which were light, crispy and thankfully not too filling for a starter. For the main meal I opted for Pizza 7 – tomato, mozzarella, roasted red peppers, red onions, portobello mushrooms, baby spinach and basil and what they lacked in choice they certainly made up for in quality. The sourdough base was a refreshing and lighter alternative to the usual pizza bases and the toppings were fresh and tasty. There was a rustic edge to the dish and it seemed much healthier and less greasy than many other pizzas available on the high street – and at £6.95 a bargain too. The food was excellent and although the service was lacking in some areas (there was at least a half hour wait for the starters) on the whole the staff were friendly and very helpful. 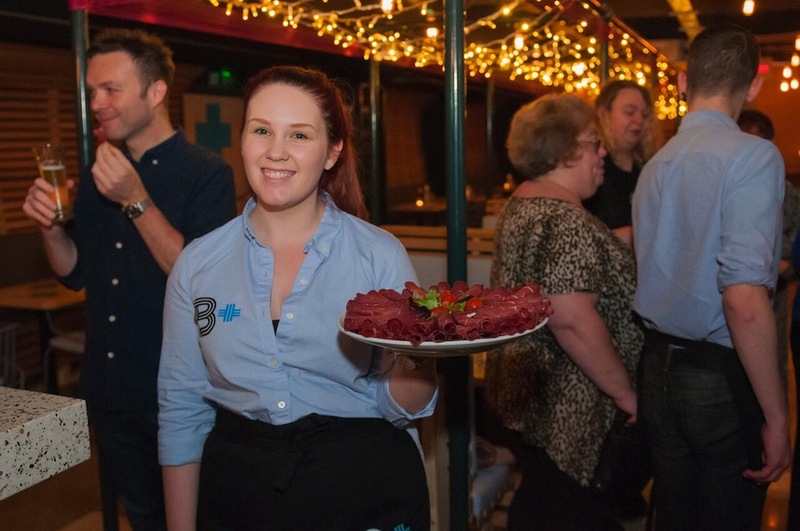 With a great ambiance, quality food and drink and a reasonably priced menu I’d highly recommend Base and Barley to anybody looking for a good night out in Exeter, and after ironing out a few creases it will surely be the one to beat. Look out for more Base & Barley’s opening around the country in due course too.